It wasn’t until recently that I took note that some of my behaviors have been anxiety masking itself as bad habits. Procrastination, for one, has been a bug bear for years that I’ve regularly pushed aside as being a typical habit of deadline-driven creative. However, and maybe age has something to do with this, I’ve taken a hard look at some of these bad habits and realized that the more and more I was putting things off, the more anxious it would make me when I was rushed to get something done. When I got down to it (and this is where anxiety creates a pretty vicious cycle) the anxiety I was having over producing work was basically stopping me in my tracks, and those fears I had built up in my head were keeping me from getting things done. So, my anxiety was causing my anxiety – I told you it got loopy! I was intrigued by this book’s name, which references a Chinese proverb that states that before you can conquer a beast you must first make it beautiful. 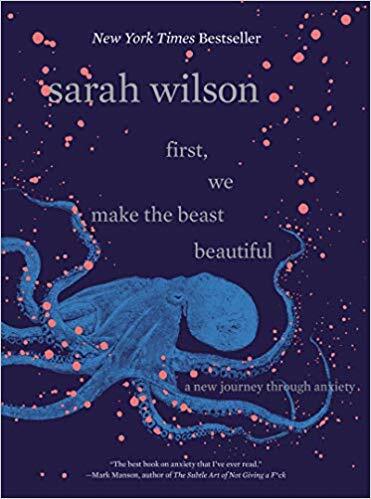 Sarah Wilson navigates through her journey with anxiety in this book. While I found some parts helpful, the structure is a bit chaotic and a little hard to follow. There’s a lot of memoir thrown in, and while Wilson’s story is engaging, I found it difficult to wade through her story to find the tools she uses to manage her own anxiety. However, one of the things that did stand out for me is to view my anxiety as purposeful and accept that it is part of who I am. I’m learning to work with the fact that the fretting about the work I create is just part of the creative process. Instead of letting it get to my head and stressing me out more, accepting it and letting it be part of the process makes it all the more beautiful and unique to me. This review was originally published in the Fall 2018 edition of RG Magazine.